This tutorial can be considered obsolete since ViSP 3.1.0 version as we have introduced a generic tracker (vpMbGenericTracker) that can replace the vpMbEdgeMultiTracker, vpMbKltMultiTracker and vpMbEdgeKltMultiTracker classes. 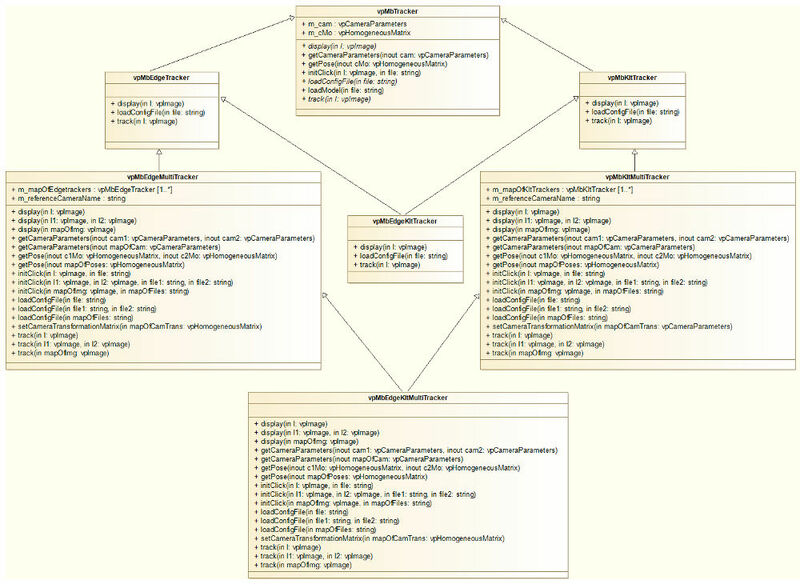 The explanations about the multi-views model-based tracking remain valid though. This tutorial describes the model-based tracking of object using simultaneously multiple cameras views. It allows to track the object in the images viewed by a set of cameras while providing its 3D localization. Calibrated cameras (intrinsic and extrinsic between the reference and the other cameras) are required. Next section highlights the different versions of the markerless multi-view model-based trackers that have been developed. The multi-view model-based tracker can consider moving-edges (thanks to the vpMbEdgeMultiTracker class). It can also consider KLT features that are detected and tracked on each visible face of the model (thanks to the vpMbKltMultiTracker class). The tracker can also handle moving-edges and KLT features in a hybrid scheme (thanks to vpMbEdgeKltMultiTracker the class). While the multi-view model-based edges tracker implemented in vpMbEdgeMultiTracker is appropriate to track texture-less objects (with visible edges), the multi-view model-based KLT tracker implemented in vpMbKltMultiTracker is suitable for textured objects. The multi-view model-based hybrid tracker implemented in vpMbEdgeKltMultiTracker is appropriate to track objects with texture and or with visible edges. the transformation matrix between each camera and a reference camera: . In the following sections, we consider the tracking of a tea box modeled in cao format. A stereo camera sees this object. The following video shows the tracking performed with vpMbEdgeMultiTracker. In this example ,the fixed cameras located on the Romeo Humanoid robot head captured the images. This other video shows the behavior of the hybrid tracking performed with vpMbEdgeKltMultiTracker. The cameras can move, but the tracking will be effective as long as the transformation matrix between the cameras and the reference camera is known and updated at each iteration. The new introduced classes are not restricted to stereo configuration. They allow the usage of multiple cameras (see How to deal with moving cameras). Next sections will highlight how to easily adapt your code to use multiple cameras with the model-based tracker. As only the new methods dedicated to multiple views tracking will be presented, you are highly recommended to follow Tutorial: Markerless model-based tracking (deprecated) in order to be familiar with the model-based tracking concepts, the different trackers that are available in ViSP (the edge tracker: vpMbEdgeTracker, the klt feature points tracker: vpMbKltTracker and the hybrid tracker: vpMbEdgeKltTracker) and with the configuration part. a vpMbEdgeMultiTracker similar to vpMbEdgeTracker which tracks moving-edges corresponding to the visible lines of the model projected in the image plane at the current pose (suitable for texture-less objects). a vpMbKltMultiTracker similar to vpMbKltTracker which uses the optical flow information to track the object (suitable for textured objects). a vpMbEdgeKltMultiTracker similar to vpMbEdgeKltTracker which merges the two information (edge and texture information) for better robustness of the tracking (can deal with both types of objects). The vpMbEdgeMultiTracker class inherits from the vpMbEdgeTracker class, the vpMbKltMultiTracker inherits from the vpMbKltTracker class and the vpMbEdgeKltMultiTracker class inherits from the vpMbEdgeMultiTracker and vpMbKltMultiTracker classes. This conception permits to easily extend the usage of the model-based tracker to multiple cameras with the guarantee to preserve the same behavior compared to the tracking in the monocular configuration (more precisely, only the model-based edge and the model-based klt should have the same behavior, the hybrid multi class has a slight different implementation that will lead to minor differences compared to vpMbEdgeKltTracker). As you will see after, the principal methods present in the parent class are accessible and used for single view tracking. Lot of new overridden methods have been introduced to deal with the different cameras configuration (single camera, stereo cameras and multiple cameras). tracking using one camera, the signature remains the same than the previous classes (vpMbEdgeTracker, vpMbKltTracker, vpMbEdgeKltTracker). tracking using two cameras, all the necessary methods accept directly the corresponding parameter for each camera. By default, the first parameter corresponds to the reference camera. tracking using multiple cameras, you have to supply the different parameters with a map. The key corresponds to the name of the camera and the value to the parameter. Construct a model-based edge tracker: vpMbEdgeMultiTracker tracker vpMbEdgeMultiTracker tracker(2) vpMbEdgeMultiTracker tracker(5) The default constructor corresponds to the monocular configuration. Load a model file: tracker.loadModel("model.cao") tracker.loadModel("model.cao") tracker.loadModel("model.cao") All the trackers must used the same 3D model. Set the transformation matrix between each camera and the reference one: tracker.setCameraTransformationMatrix(mapOfCamTrans) tracker.setCameraTransformationMatrix(mapOfCamTrans) For the reference camera, the identity homogeneous matrix must be set. Initialize the pose by click: tracker.initClick(I, "f_init.init") tracker.initClick(I1, I2, "f_init1.init", "f_init2.init") tracker.initClick(mapOfImg, mapOfInitFiles) If the transformation matrices between the cameras have been set, some init files can be omitted as long as the reference camera has an init file. Get the pose: tracker.getPose(cMo) tracker.getPose(c1Mo, c2Mo) tracker.getPose(mapOfPoses) tracker.getPose(cMo) will return the pose for the reference camera in the multiple cameras configurations. The following example comes from tutorial-mb-tracker-stereo.cpp and allows to track a tea box modeled in cao format using one of the three multi-view markerless trackers implemented in ViSP. In this example we consider a stereo configuration. OpenCV is required and the KLT module has to be enabled to use the KLT functionality. Please refer to the tutorial Tutorial: Markerless model-based tracking (deprecated) in order to have the explanations about the configuration parameters (Tracker settings) and how to model an object in a ViSP compatible format (CAD model in cao format). To test the three kind of trackers, only vpMbEdgeKltMultiTracker.h header is required as the others (vpMbEdgeMultiTracker.h and vpMbKltMultiTracker.h) are already included in the hybrid header class. We used a pointer to vpMbTracker to be able to construct a tracker according to the desired type (edge, klt or hybrid) but you could directly declare the desired tracker class in your program. The dynamic cast is necessary to access to the specific methods that are not declared in vpMbTracker.